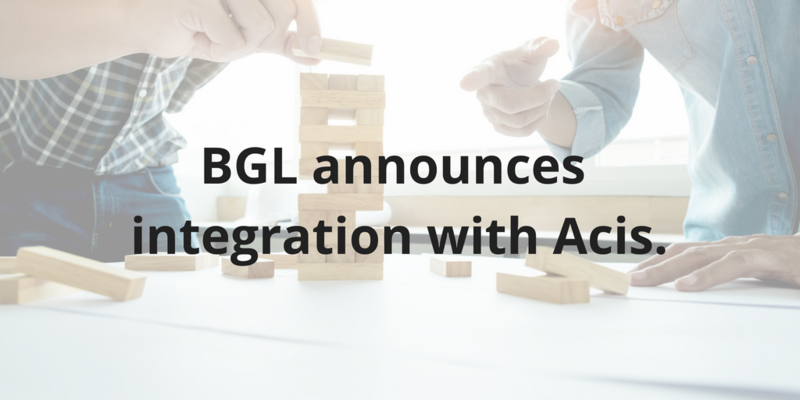 “It is great to have Acis on board as part of BGL’s Ecosystem of integrated document providers for our clients” said Ron Lesh, BGL’s Managing Director. “This integration with CAS 360 and Simple Fund 360 saves time and provides huge efficiencies for our clients”. The integration, available through the BGL’s API (Application Programming Interface), enable users to load Acis documents directly into their CAS 360 and Simple Fund 360 softwares. Additionally, users can create companies in CAS 360 or funds in Simple Fund 360 to bring data straight into Acis system. The completed documents can then be loaded direct from Acis system to CAS 360 and Simple Fund 360. “When software talks seamlessly to each other, it is a win-win for BGL, Acis and our mutual clients”, stated Lesh. “The goal for Acis in developing integrations with major industry players like BGL, is to deliver time and cost efficiencies for our clients”, said Acis CEO, Matt Neibling. “It’s no secret that accounting firms and professional wealth advisers are heavily invested in simple-to- use systems that reduce administrative and professional hours, and fit seamlessly into their established practice management processes”, added Neibling. “Our integration with CAS 360 and Simple Fund 360 delivers this in spades to our Acis clients”, ended Neibling.